This is the recipe for a classic Japanese nimono, or braise. Nimono can use any type of vegetable or meat, and is a staple in any Japanese family table. They are warm and comforting, and perfect for these cooler months. The Chinese talk a lot about what foods are ‘warming’ or ‘cooling’ for the body, and I think there’s definitely an element of truth to it. Root vegetables, which are season in the colder months, are ‘warming’ and so we should be eating more of those. 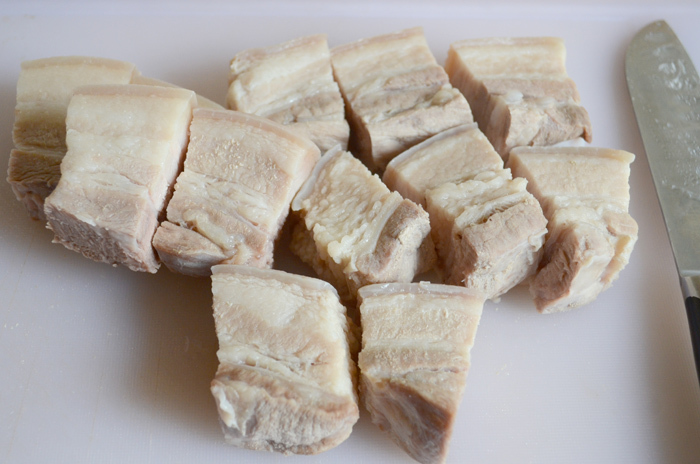 Pork belly if cooked correctly can be very good for you, and full of vitamin B. This recipe cooks out all the fat in the first process so the gelatinous tissue left on the meat is mostly collagen, which is great for your skin. Here are the two main ingredients. Try to get a cut of pork belly with a reasonable amount of fat running through it (most of it will get cooked out in the first process). 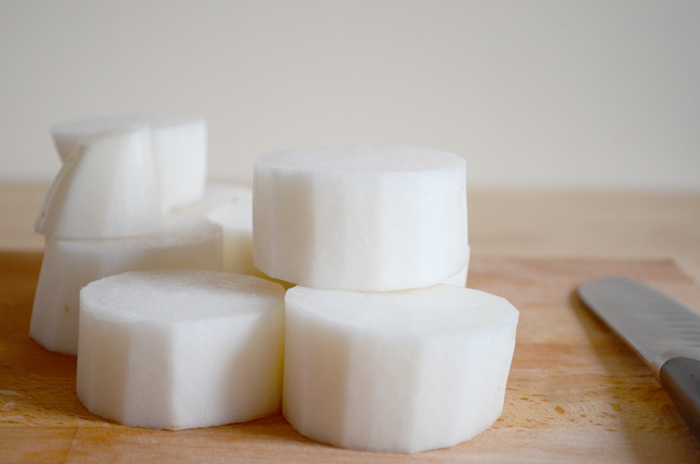 Daikon, or Japanese radish, is best in winter — try to find one that is plump and firm with a wrinkle-free skin. Peel and slice the ginger, and cut the spring onion into 5cm pieces. 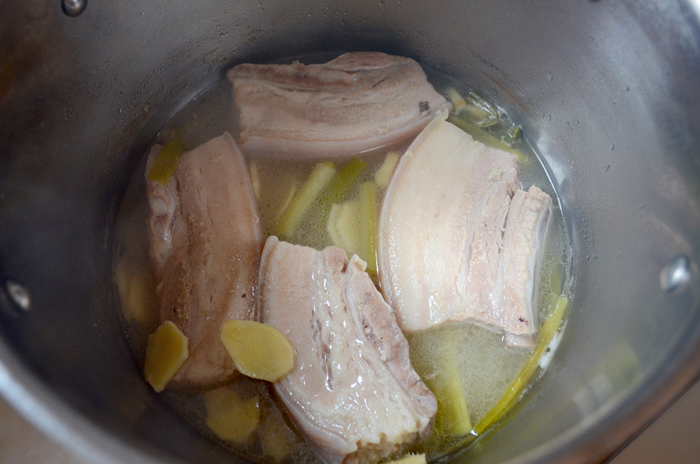 Place the pork, ginger and spring onion in a pot of cold water and bring it to the boil. Once it’s boiling, turn it down to a low-medium heat to simmer for an hour. Peel the daikon, and cut them into 4-5cm pieces. They should be roughly the same volume so they cook at the same time. 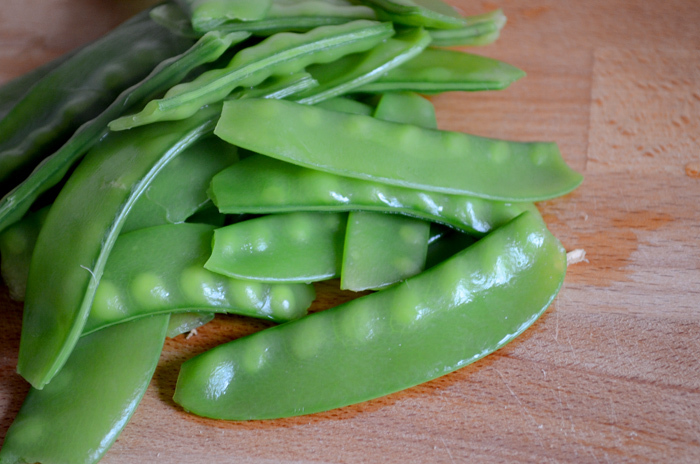 Blanche snow peas, or prepare any other greens for presentation. This the pork after an hour, a lot of the fat has cooked out and the flavors of the ginger and spring onion have infused into the meat. Empty the pot through a sieve, discarding the spring onion but keeping the ginger. Give the meat a quick rinse and wash the pot ready for the second cook. 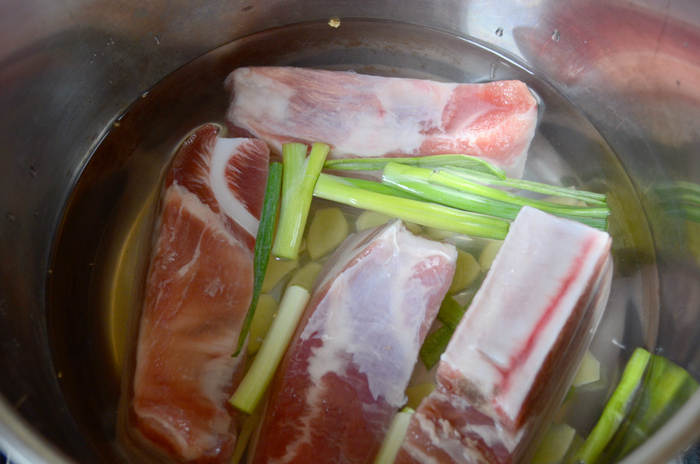 Cut the pork into 4cm pieces. 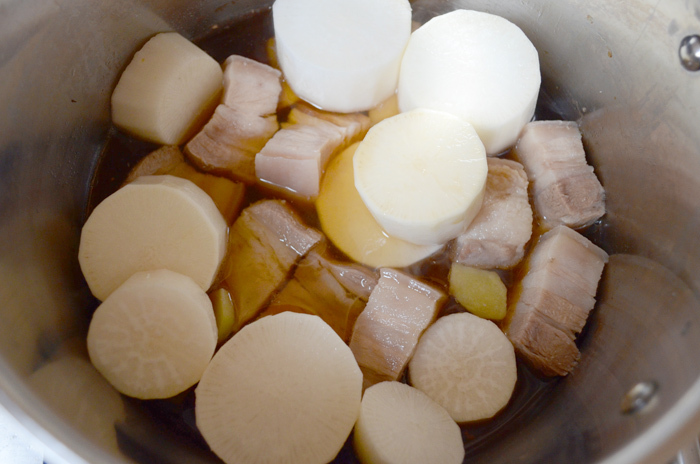 Place the pork back into the pot, surrounded by the daikon pieces. Add the seasonings and water, making sure the pork gets an even coating. Cook this on simmer for 1 hour or longer, this part is up to your liking. 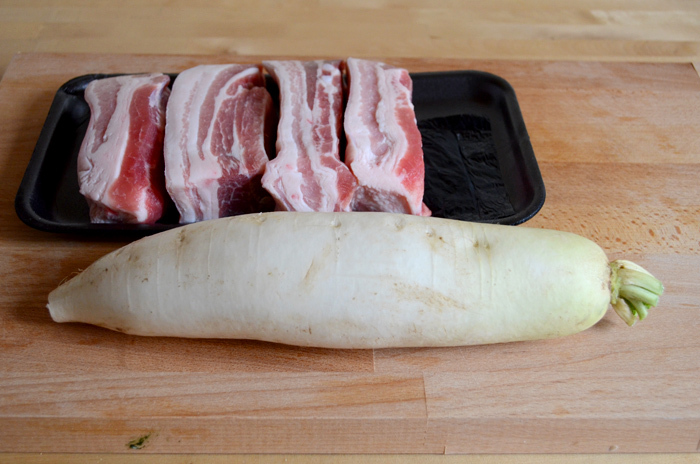 I stopped when the daikon became translucent and took on a warm amber color, and checked that the pork was tender and flavored too. 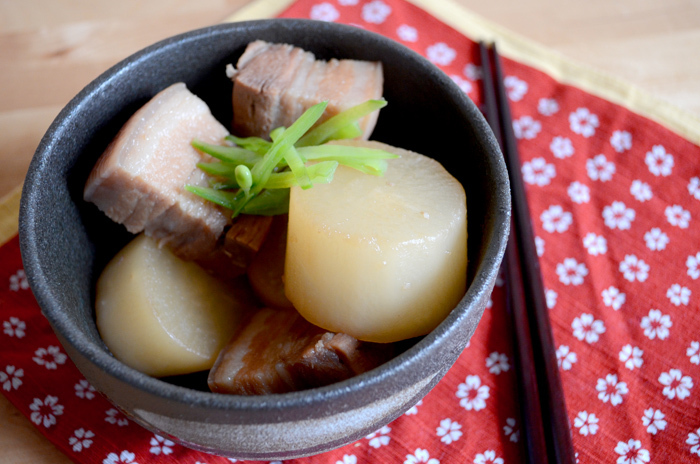 If you want to continue cooking the meat but the daikon is ready, just remove the daikon from the pot and continue to cook the pork. Add water as necessary, if the mixture is reducing too quickly. I like the daikon to be a bit al dente the first day, and the second day it will soak up even more flavor and the daikon will be a little softer! Serve with some greens and a little bit of broth. Wow your website looks amazing! LOVE how the pictures of the food look mouth watering and it even shows step by step instructions and pix! 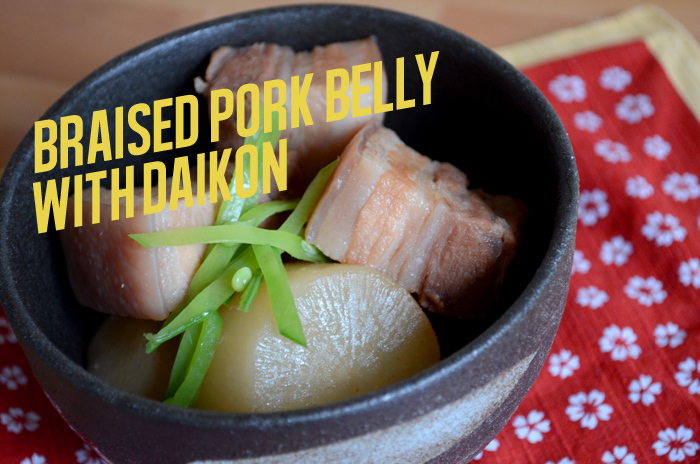 My mom makes pork belly + daikon for me all the time. It’s hard to get recipes from her though since many things get lost in translation since she barely speaks english. I am excited to try cooking this for the first time. Thanks! Hi Angela, thanks so much for your comment! I hope you enjoy making the recipe and I hope to add some more classic Japanese recipes soon too.